With all the heartache and work, there was also fun time. Harold became good friends with Bobby Greenwood, a wonderful golf pro who resided in Tennessee. Bobby truly had a conversion experience and turned his life over to the Lord. The excitement of sharing the Gospel appealed greatly to Bobby and he often asked his good friend Harold to travel with him. Harold called it golf evangelism. Many times different pros would ask Harold to preach at their home church when the tournaments were close to them and of course the traveling golf evangelist accepted their invitation. The result were incredible and the demand for him to speak in other churches spread throughout the golf tours. And now, as told in his own words, PGA Golf Professional, Bobby Greenwood. Year’s ago, “Reader’s Digest” had a popular segment called “The most unforgettable character that I have ever met.” Well folks, Brother Harold is indeed that man in my life. As I write this part of my experiences with Bro. Harold, I am already looking forward to reading this book about his life. Leaving the PGA Tour after 7 years, returning back home to Cookeville, Tennessee, I would teach at the Tennessee Golf Academy just to be able to be with my two children for a week. They were ages 8 and 6 years old at that time. PGA professional Jack Wall was a dear friend of Bro. Harold. And, Jack met me at the Tennessee Golf Academy which was held at Fall Creek Falls State Park. Jack was an excellent golf instructor as well as an intense student of the game. He saw my knowledge of the golf swing and offered me 25% of his golf company if I would teach at Benchcraft Golf Co. one day a week. So, I would drive to Nashville and spend the night at the Benchcraft Golf Co. which was located on Church Street and be ready to teach the next morning. Some days I would give 10-12 lessons. One of Jack Wall’s many talents was his ability to network people. He would bring people to gather and they would sometime accomplish great things. Jack introduced me to Bro. Harold and the rest is history. We would leave the hustle and bustle of Benchcraft Golf Co. which was located on Church Street in Nashville, TN, and go out back in the alley by the dumpster and talk. One of my few talents is my ability to identify greatness in people. I was immediately intrigued by the honest sincerity of the man. Of course, I could tell that he truly loved the Lord but I had no idea of the magnitude of this love. He was completely sold out to Jesus. His whole life is doing the work of the Father for the Kingdom. I was to learn that Bro. Harold is the most generous, giving and forgiving man that I have ever known. In short, Harold Witmer is the finest Christian man that I have ever known! Jack and I would take Bro. Harold to our golf clinics and various outings to the Bahamas and State Parks. He became our official Golf Chaplain for Benchcraft Golf Co. In the Bahamas, there on the beach, Easter Sunrise service, many people heard the saving power of Jesus Christ. It was great! Through the years and our travels together, I have learned so much about how to learn to love God and obey His commandments. I am a better Christian man because of being with Bro. Harold. Thank you Jack Wall and God, not necessarily in that order, for putting Bro. Harold in my life! I will share one story with you about his boldness in the Lord. One year, I qualified to play in the Senior PGA Championship held at Laurel Valley Country Club at Ligonier, Pennsylvania. I played a practice round with the great Arnold Palmer and after the round we went in the luxurious clubhouse to have lunch. We were eating with the world leaders in the golf industry and Bro. Harold just resting in the Lord and so relaxed. After lunch we made our way through the large crowd of spectators on our way to the practice range. I brought Bro. Harold through ropes and he began talking with several pros as I continued to hit range balls. The next thing I knew, a hush fell over the crowd as Bro. Harold had a circle of pros engaged in prayer. Later I learned that Chi Chi Rodriguez had requested that Bro. Harold lift a curse off him that was put then by another golf pro. Chi Chi and Doug Sanders became life long friend with my dear friend Bro. Harold. I could tell you of how Bro. Harold became publisher of Tennessee’s first golf publication or the many trips that he took with Jack Wall and myself on our various golf clinics and vacations but, that would take another book. Just for the record, may I say right now… To be a Christian partner and friend to Bro. Harold is a great honor for me. Without his help through the years, I would never have been inducted into Tennessee Golf Hall of Fame. God bless you my brother. Please just let me thank Brother Harold Witmer for being God’s servant and my dear friend. 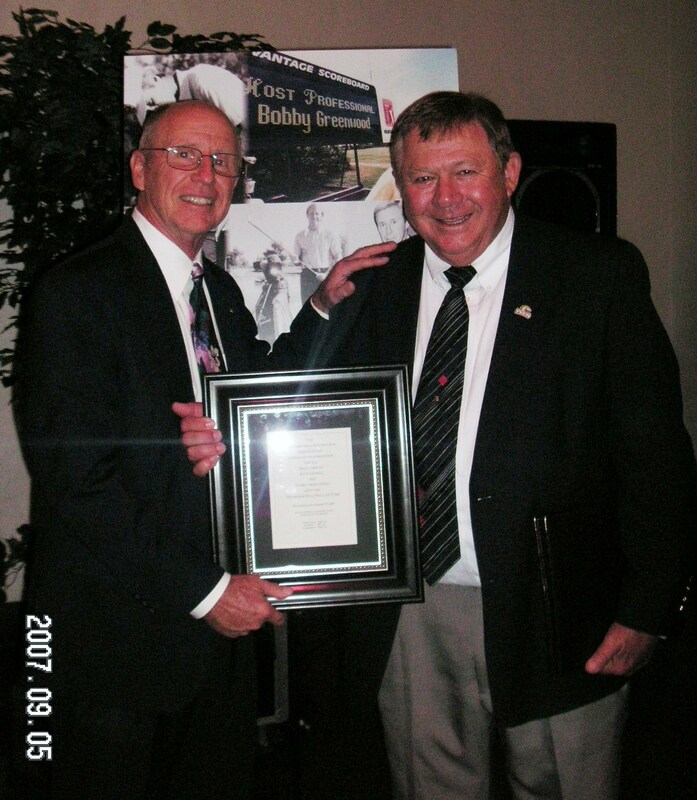 When Bobby was installed into the Tennessee Golf Hall of Fame, his wonderful brother in Christ was there to share in the excitement. To quote Bobby from an autographed picture we have these words: “You are a great friend and without your help I would never have made the Hall of Fame. God bless you and sister Faye. Source: “Two Are Better Than One”, A True Story About a Real Person Who Serves a Living God – Rev. Harold Witmer. Written & Edited by: William H. Corley, First Edition 2008. “In golf, when you have the “honor” on the tee; then you have earned the right to go first. It seems only fitting that concerning the University of North Texas golf team that Bill Garrett should go first. We, the rest of his teammates look forward to being with Bill once again and perhaps ev…en playing golf with him and enjoying all the promises of God. When I get my new body, as promised by my Lord and Savior, I hope that it is 6’6”tall just like Bill Garrett’s instead of one that is 5’9” tall. The Lord told us to rejoice at death and cry at birth (Ecclesiastes 7:1-4), but I haven’t got the hang of that yet. Heaven must be wonderful for that to be true. May God continue to bless you, roomie. BG”. Bobby Greenwood had a very hectic and fun 2008. Being a spectator to these PGA Tour tournaments – The Players at Sawgrass, Ryder Cup at Valhalla and the PGA Grand Slam of Golf in Bermuda, brought back memories for him when he played the PGA Tour… However, due to a busy schedule, updating this website and uploading new photos, etc. has been delayed. We hope to remedy this in the coming months. ~ GreenwoodPGA.net Team, 3/4/2009. ** NEW NEWSPAPER CLIP uploaded – “The Bobby Greenwood-Jack Nicklaus Match” – at the SELECTED ARTICLES Section of the Official Website of Bobby Greenwood, PGA [GreenwoodPGA.net]. ** NEW LINK added to the site – NCAA/Missouri Valley Conference/College Career of Bobby Greenwood. ** Please STANDBY for more updates at the official website as we also update the PHOTO ARCHIVE/GALLERY. ** Read the latest media article below on Bobby Greenwood, written by Buddy Pearson, Managing Editor of Herald-Citizen, July 27, 2008. Jack introduced me to Bro. Harold and the rest is history. We would leave the hustle and bustle of Benchcraft Golf Co. and go out back in the alley by the dumpster and talk. One of my few talents is my ability to identify greatness in people. I was immediately intrigued by the honest sincerity of the man. Of course, I could tell that he truly loved the Lord but I had no idea of the magnitude of this love. He was completely sold out to Jesus. His whole life is doing the work of the Father for the Kingdom. I was to learn that Bro. Harold is the most generous, giving and forgiving man that I have ever known. In short, Harold Witmer is the finest Christian man that I have ever known! Bobby Greenwood has been recently added on Wikipedia with other American professional golfers! Remembering an old friend that has just gone on to be with the Lord, Bobby Nichols from Cookeville, Tennessee, will be greatly missed by the Tennessee Section of the PGA. I’ll miss you my brother…. God speed. Note: Bobby Greenwood had SEVEN HOLE-IN-ONE during his golf career, he just couldn’t remember the 7th one…. Bobby Greenwood of Tennessee, played the PGA Tour for seven years, 1969 through 1975. Prior to his professional career, he was twice ranked in the Top Ten Amateurs in the U.S. by Golf Magazine & Golf Digest. A Three-Time NCAA-All American at North Texas State University , he was inducted into University of North Texas Sports Hall of Fame in 2002. Bobby is now a golf course architect out of his hometown, Cookeville, Tennessee.